The Department of State Services (DSS) has said that it has uncovered plans by the All Progressive Congress (APC) to hack into the database of the Independent National Electoral Commission (INEC). 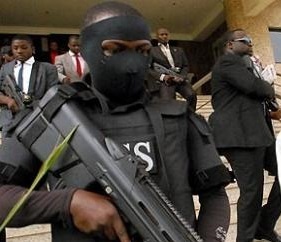 Speaking at a news conference in on Wednesday in Abuja, the Deputy Director, Public Relations, DSS, Marilyn Ogar said a video with tutorial for hacking was uncovered when the service raided a building in Lagos. Ogar said the DSS also discovered lists containing names and photographs of security personnel, foreigners and minor/under-aged on the registered members list of the APC, Leadership reports. She claimed that the APC filled forms without passport photographs, books containing names of people with phone numbers and many envelopes containing passport photographs of people were also recovered. Displaying the lists and other items recovered from the building to newsmen, she explained that the confessions from the staff arrested at the APC office at 10,Bola Ajibola Street, Ikeja, and the items retrieved from the building showed that the party had an elaborate plan to hack into the commission’s database and inflate the number of its membership. “We suspect that there was an elaborate and well-articulated plan to inflate the party’s membership data as well as hack into INEC’s voter registration database,” she said. Speaking about the video of 21 hacking tutorials, she said: “The tutorial video focused on the following areas: How to become a hacker and steps to take to avoid detection in the process of hacking web services. “Steps and procedures of system hacking, passwords cracking, decrypting, escalating access privileges and creating backdoors to servers. According to her, the video also outlined ways to identify vulnerabilities in systems and how to cleverly drop a USB flash drive in a target establishment. Ogar alleged that the drive, when plugged into any commuter, could transmit “malicious codes enough to gain access into and compromise the entire system of the target organisation’’. She said that suspects arrested in connection with the raid had been charged to court, while investigation had begun, while promising to keep the public updated on further developments. It would be recalled that operatives of the service raided the building at No. 10, Bola Ajibola St., Ikeja, Lagos state, on Nov. 24, 2014, following a tip-off. Everything is politicized in Nigeria to the extent there is total disregard for the intelligence of NIGERIANS. Should this be an INEC announcement?. DSS should bury their head in shame. If a political party will want to hack by now, they will not start by learning how to hack, they will rather hire an Hacker that will do the hacking job…. This is a big lie Ogar! I never believe the stories DSS is giving. It’s a calculated plan to disorganized APC. The Almighty Allah well never allow them to succeed. It is neither here no there. These politicians are too desperate. Let there be a thorough investigation of these findings. It is a serious matter. Nothing should be left to chances. Let the court do an in-depth prosecution of such high level crime against the Nigeria State. Pls DSS should endeavour to keep Nigerians informed of developments. I never trust APC before, they can do and undo DSS should continue with the investigations. And let nigerians ask themselves, is this the change we are expecting?????? how I wish I am the president, by now, all the apc politicians who were involved should be sent to kirikiri that he promised Jonathan. what a serious crime. DSS, keep the good work up! !